Cosmetic surgery used to be a furtive affair, something to be embarrassed about. No more. Now, it's time to flaunt bigger breasts and narrower noses thanks to 24-year-old Hao Lulu who underwent a series of high-profile cosmetic surgery procedures in Beijing last year. "Everybody wants natural beauty, but nobody is perfect," Hao, who turned herself into a stunner, wrote in her diary. "Everybody has flaws, but now we can have shortcuts to beauty." Inspired, young women are more than willing to go under the knife in many Chinese cities to improve their looks - and their lot in life. In Chengdu of Southwest China's Sichuan Province, and Jinan of East China's Shandong Province, for example, plastic beauties are blooming. In 2000, Jinan Cosmetic Surgery Hospital used to handle three to five surgical procedures a day; now it has 10 patients daily, Jinan Times reported. "Although Hao's operation was by no means uncontroversial and some scientists worry that the sole emphasis on physical beauty would confuse traditional aesthetic standards, she has certainly helped more people to attach great importance to physical appearance," Zhang Qingguo, president of Jinan Cosmetic Surgery Hospital, was quoted as saying by the newspaper. A similar beauty project is currently on in Guangzhou, capital of South China's Guangdong Province. Baiyun Yuandong, a local cosmetic surgery hospital, is working on Guan Ying, who comes from Qingdao, Shandong Province, to turn her into what the hospital claims to be the city's first plastic beauty. 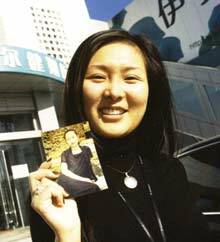 "Guan was encouraged by the first plastic beauty in Beijing, and like Hao, she just wants to be more beautiful," said Wang Liangming, president of Guangzhou's Baiyun Yuandong cosmetic surgery hospital. But reports of Guan's surgery did not result in a flood of beauty hopefuls at the hospital. 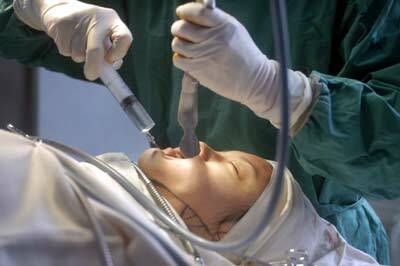 "I do not think that the cosmetic-surgery industry is booming as much as the press says it is. It is still in the nascent stage," said Wang, who was in charge of Guan's operation. "Both the public and industry need to improve their knowledge about cosmetic surgery. Especially, practitioners should improve their skills and behave ethically or they will lose favour," Wang added. Hao, and those of her ilk, have certainly aroused public controversy. In Beijing, Shanghai and Guangzhou 36 per cent of residents were opposed to Hao's effort, saying they would never have cosmetic surgery to improve their appearance, according to a survey conducted by Beijing Youth Daily at end of last year. "I would never undergo surgery, it would be like torture," said a respondent, Qian. According to the survey, only 21 per cent would say yes to surgery; and 43 per cent think cosmetic surgery will become popular across the nation. At the same time, scientists warn that surgery entails risks and people should not rush in blindly. Xiao Liu, a 20-year-old woman in Changchun, Northeast China's Jilin Province, was horrified after a hole appeared on one of her eyelids after she went to a beauty salon to have the operation in August last year. According to an estimate of the China Cosmetology and Hairdressing Association, there have been more than 200,000 malpractice lawsuits filed by patients because of disfigured operations in the last decade. Cosmetic surgeries had become so popular and common that the government issued regulations to discipline the industry in 2000. According to the regulation, all institutes that offer cosmetic surgery must have licences and meet required medical standards for doctors' qualifications and equipment. Despite the regulations, the growing popularity of plastic surgery has led to unlicensed practitioners offering services for cheaper prices. The State Administration for Industry and Commerce last year found that the cosmetic-surgery sector was one of the four industries that was beset by problems. A number of institutes have no operating permits issued by the government and do not meet the medical standards for doctor qualifications and equipment, according to the inspection. Statistics from the Chinese Consumers' Association also show that consumer complaints are increasing, with an average of 20,000 lawsuits filed every year. "The cosmetics industry has big potential for profits; and as a result, practitioners try to make money by any means, legal or illegal," said Wang. He also blames the disorderedly cosmetics market, saying that there should be an organized institution to issue standards and regulations to make the market in order. A survey conducted by the Ministry of Labour and Social Security last year showed about 85 per cent of the cosmetic surgery institutes in China are privately owned, with most of them operating on a small scale. Wang said that the unqualified practitioners are mainly in private institutes, which hinder the development of the industry. Statistics from the survey indicate that only 11.7 per cent of the practitioners had obtained higher education, with most not even attending qualified training programmes. Cosmetic-surgery practitioners and institutes in China currently total about 11.2 million and 1.5 million respectively, with nearly four in five institutes opened in the last five years, according to the survey. Spending on cosmetics and related products totalled 160 billion yuan (US$19.3 billion) last year, a 20 per cent year-on-year increase, the survey showed. In addition, each urban resident spends an average of 30 yuan (US$3.7) on cosmetics every month. The gross production value of the cosmetic industry makes up more than 5 per cent of that of the tertiary industry, according to the survey, indicating that it is showing higher growth than other service sectors.